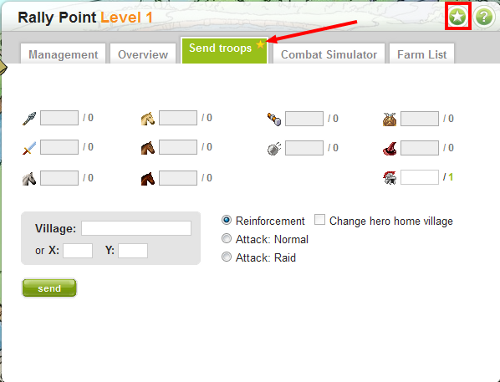 As you can see, the “send troops” tab has been marked as my favourite tab, as indicated by the golden star at the top. (Marked by the arrow) What this means is that every time you go to the rally point (or alliance; market place; ect with the tabs) the favourite tab will be displayed first. To set the favourite tab, navigate to the tab you wish to mark as the favourite, and then click the green button with the star at the top, besides the question mark (marked by the square in the earlier picture).